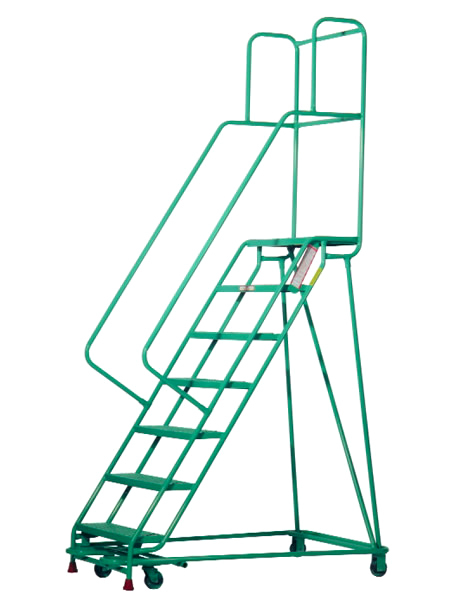 The ultimate rolling ladder in safety, appearance & construction. 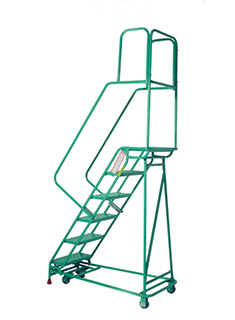 Whether your application calls for work with racks, machinery, or other materials and equipment, you cannot go wrong with the Standard Rolastair™ Rolling Ladder. 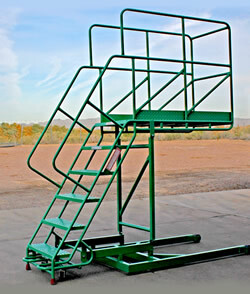 Our flagship design moves toward your project on (4) heavy duty casters, to provide safe and convenient access onsite. 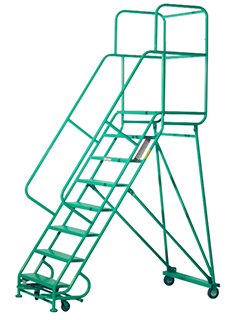 While at the top of the ladder stand, personnel are presented with a comfortable workspace that is guarded by strong steel hand rail for safety. 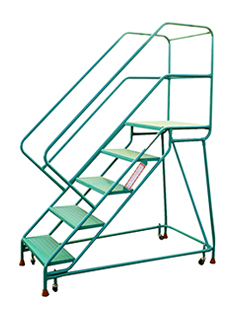 No Handrails, attractive and very handy in the office, library vault, stockroom, machine shop, etc. All models equipped with four each 2" dia. 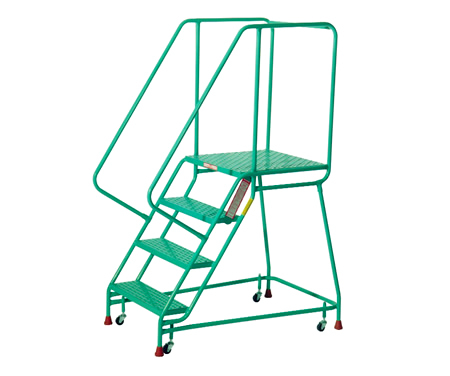 Spring loaded casters and four large, non-skid rubber shoes to grip the floor when in use. 26"W x 16"D 15 lbs. 27"W x 21"D 22 lbs. 28"W x 29"D 31 lbs. 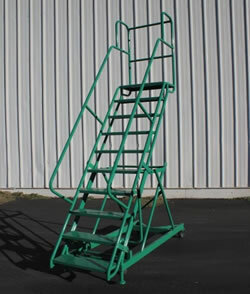 2 step has 22" tall handrails, 3-5 step has 32" tall handrails. All models equipped with four each 2" dia. Swivel spring-loaded casters and four large, non-skid rubber shoes to grip the floor when in use. 27"W x 21"D 32 lbs. 28"W x 29"D 42 lbs. 30"W x 35"D 50 lbs. 31-1/2"W X 41-1/2"D 57 lbs. 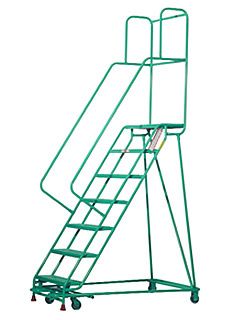 42" tall guardrail around platform Stepjack foot controlled floor lock assembly assures dependable “stop and go” safety on all ladders in this group. 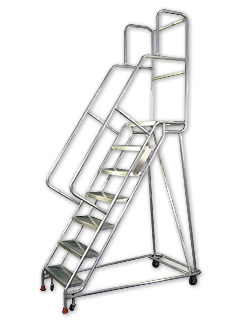 All Stepjack mechanisms are equipped with two 3-1/2” swivel casters and two fixed casters.6 through 10-step models have two 3-1/2” rigid casters under the platform end.11 through 15-step models are equipped with 5” rigid casters. 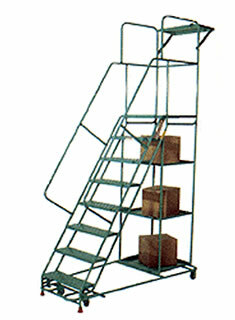 13 step units and larger are provided with a folded base for ease and economy in shipping. 33"W x 48-1/2"D 81 lbs. 35"W x 55-1/2"D 85 lbs. 8 26H8 76" 26" 118" 36"W x 62"D 116 lbs. 9 26H9 85 1/2" 26" 127 1/2" 36"W x 69"D 126 lbs. 10 26H10 95" 26" 137" 36"W x 76"D 135 lbs. 11 26H11 104 1/2" 26" 146 1/2" 39"W x 82 1/2"D 146 lbs. 12 26H12 114" 26" 156" 42"W x 89"D 158 lbs. 13 26H13 123 1/2" 26" 165 1/2" 45"W x 96"D 190 lbs. 14 26H14 133" 26" 175" 48"W x 103"D 232 lbs. 15 26H15 142 1/2" 26" 184 1/2" 52"W x 110"D 243 lbs.